We are the leaders in custom business signs throughout the Buffalo and Rochester area along with the rest of Western New York. We produce the highest quality carved, sandblasted and gold leaf lettered signs. Each custom business sign is given "handcrafted care" with a quick turnaround from drawings to delivery of the finished product. When it comes to producing your custom business sign, there really is "nothing we can't do". 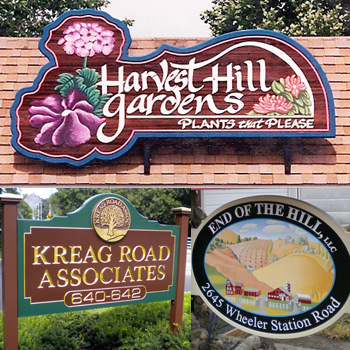 We also manufacture custom New England style, 3-D wood or High Density Urethane signs. Check out our portfolio to see the level of detail and quality given to every sign we build.